Get GM Mastery: NPC Essentials from RPGNow or find more GM Mastery products. You too can earn money from writing articles by signing up for InfoBarrel. GM Mastery: NPC Essentials by Johnn Four is a role playing game supplement that is part of the GM Mastery Series and is published by Roleplaying Tips. The supplement is designed for the d20 System and covers how Game Masters (GMs) can role play NPCs (Non-Player Characters). The supplement isn't about generating an NPCs stats; it's about building their character and background, and then running them in a campaign. As well as the traditional non-player characters, it also covers the more non-traditional, discussing handling monsters, items (and not just intelligent items) and equipment. Credit: V. ShaneNPC Essentials is only available as a colour PDF. With the book being designed for the d20 System, some of it is covered by the Open Game License. There are seven chapters in the book. The first, Introduction, is a brief one page chapter that outlines the GM Mastery series, the author and the book's contents. The second chapter, NPC Design, is about the different types of NPCs that can be used, including items, and the roles they play, from major to minor. This covers how the different roles should be handled - a major NPC requires a much more in-depth design than a bit part. After the roles are considered, the actual NPC themselves are considered, including such things as their history, appearance and equipment to name a few. Chapter three is NPC Role Playing. This chapter is pretty much what it sounds like - how the GM should play the NPCs, and in such a way to make them more believable. Campaign Management is the fourth chapter and related to handling Non-Player Characters in a campaign, such as organising your records so you can easily find the needed details (something that is even easier these days using computers and online data storage) and making the NPCs mesh into the world they are in. There is a six step cast creation process at the end of the chapter to follow for creating an entire cast of NPCs. Chapter five, NPC Archetypes, covers a number of NPC archetypes that players are likely to encounter. These are Craftsman, Merchant, Servant, Upper Nobility, Soldier, Artist/Entertainer, Politico/Minor Noble, Guild Leader, Clergy and Beggar. Each archetype provides details on various ways of handling these characters, as well as a number of plot hooks that could result in the players interacting with them. Credit: James MatheThe next chapter, six, is the Mini-Adventure. This is the most d20 specific part of the book as the short adventure, "When We Practice to Deceive," is designed for the d20 System. It is more about determining what the various NPCs want in the story and how to handle them so, even for other systems, it is still worth a read to get ideas on handling your own NPCs. There are a substantial number of GM Notes sidebars providing details of how to play the NPCs. The final chapter is Charts and Sheets, and this contains various charts for generating NPCs randomly, if needed, or otherwise just picking whichever result is desired, followed by a number of different sheet types for noting the information generated about each NPC in the creation process, as well as a means of keeping them updated as covered in Campaign Management. The first chart is Story Roles vs. NPC Elements, which is a table showing which factors discussed earlier should be used with the various NPC types that were also detailed, including inanimate objects. The various factors are not all required for every type; this table gives each NPC type different rankings for the areas, from recommended down to those that can be left out. There appears to be an error with this table; the final column, R, does not have an explanation as to which type it is referring to, and there does not appear to be anything left out. These factors are then covered in the following tables: there are several tables on NPC name generation, both first and last, fantasy and modern, Background, Appearance, Traits, Quirks, Secrets and Events. All of this factors are explained in detail earlier in the book, although the individual ones are not, as in some cases there are a thousand options to choose from. Some of the charts are designed around d20 System characteristics, but these are minor and easily changed. The book's main index is not of much use, as it only divides it into the various chapters, without any reference to the different sections in each, and there isn't a more detailed index. Fortunately, there are built-in bookmarks in the PDF, which makes it easier to navigate to the various sub-sections in the it, although this is of no use if the book is printed out. There are a handful of colour illustrations throughout the book as well as two colour maps from the mini-adventure in chapter six, and many of the tables in the book have vari-coloured backgrounds. There used to be an associated GMMastery website to go with the series but that no longer exists, but the original Role Playing Tips site is still going, which does provide many GM tips, as well as a page dedicated to the various publications. The book does mention Feats, a characteristic of the d20 System and its' derivatives, but other systems often have similar abilities, or something that can be used to replace them. Apart from this d20 specific mention, which is quite brief, and the included mini-adventure, this is really a rather generic supplement that is suitable for most systems. It may be aimed primarily at fantasy games, but the principles are easily transferable to other genres. A non-player character's motivations are going to be pretty consistent no matter what genre they are in; it's just the specifics that are going to change. 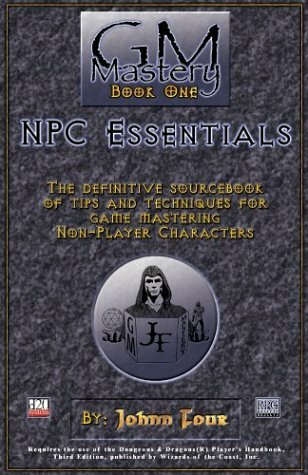 GM Mastery: NPC Essentials is a useful supplement for any GM who wants to create more in-depth, believable characters for their game and run them better and in a more organised manner, including having the characters evolve just as real ones would.